Welding is more than a mere function, it requires passion to get it right, and the Lincoln Electric Easy Mig 140 Welder is a welding machine that uses accentuates that passion. IT features common 120 volt input power and is a perfect choice for home projects, farm repairs or basic auto body work. It has a simple 2-knob tapped control for easy setup of gasless flux-cored welding, which is great for deep penetration on thicker steel. This easy to use machine is made of weldable metals and comes highly recommended. It is MIG ready, with dimensions of 18 5/8x 10 1/8×14 and up to 140 amps. This machine has a welding wire diameter of 0.025-0.0045 and the power cord is 6ft long. A regulator and gas hose are included when purchased. Fully adjustable drive system that reduces chances of wire tangling and crushing. Rigid drive aids wire alignment- the cast aluminum body with an enclosed multi-stage gear box delivers improved torque and quiet operation. Brass-to-brass gun connection that enhances conductivity. Has an Easy-turn numeric drive tension indicator which identifies optimized ranges for different wire diameters. It has high performance with a broad 30-140 amp welding output range, and a very smooth arc that starts with minimal spatter and makes dialing in your application easy. Comes with a shielding a gun, gas apparatus, welding wire(sample spool of .025in. (0.6mm) diameter super arc L-56 premium MIG wire and .035in. (0.9mm) diameter inner shield NR-211MP flux-cored wire. Readily available and one can order online. 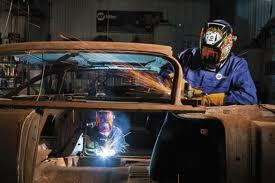 Has CDs that include an instruction manual, how to weld video, learn to weld manual and parts pages. Has a spool gun ready switch that allows the user to select a spool gun or standard push gun drive operation. 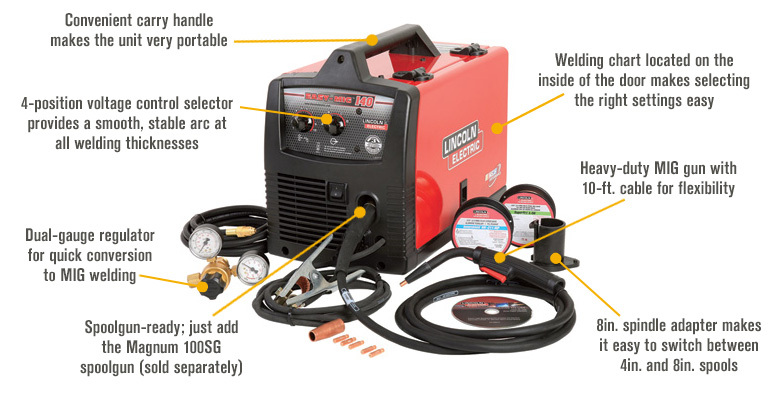 The Lincoln Electric Easy MIG 140 welder is excellent and has minimum customer complaints. It is, however, very heavy. That it has a continuous rheostat voltage control knob that allows one to find the sweet spot for welding certain thicknesses of metal. That it has a high performance, therefore one can accomplish a significant amount of work within a limited time. Can be used for domestic purposes i.e. not only for the workshops and garage. It is durable thus making your one time high-purchase worthwhile, and the machine will not keep breaking down. That it can be purchased online and delivered to you within a short period. It is easy to use; with fast tool-less drive roll changeovers. The dual truck drive roll ensures positive flux-cored wire feeding with standard wire diameters. The manual is not well elaborated and might give a first timer a hard time in setting up and using the equipment appropriately. The high pitched noise the fan makes when working with the MIG is a big turn off. 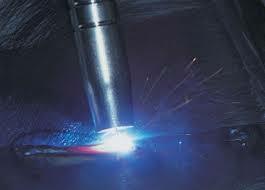 Most customers who have bought and used this Lincoln Electric MIG welder are quite satisfied with the results and services it gives and would recommend it to anyone looking for a personal use all around the welder anytime. In addition, those who have bought this MIG did so because of its reputation in the market and the excellent reviews from other satisfied customers who have used it before. Although most people complain about the high price, those who have bought it agree that it is worth every last coin as it has given them good service and is also very durable. Others complain that if your MIG breaks down and needs repair it might take a long time for the parts to be ordered and delivered at the Lincoln repair shop. If you are looking to have a strong and durable and high-performance welding machine, Lincoln Electric Easy MIG 140 welder is it. The services you are going to get from this MIG is great, and it will serve you for a longer period. 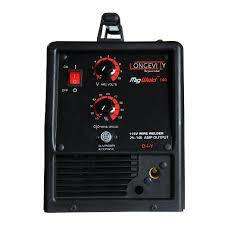 Every home needs this high power tool, and every welder should consider it a sound investment.